Brian Eno first came to prominence in the music scene as the keyboard player to lead singer Bryan Ferry in the band "Roxy Music". He then went on to a wide variety of roles in the music business, including the role of producer for David Bowie and the band U2. As a composer, he has worked extensively in the field of synthesiser and experimental music using computers. His connections with experimental music have spanned a number of years, where he has followed in the footsteps of composers such as John Cage. He also provided the foreward to Michael Nyman's book on "Experimental Music", which featured the work of such early pioneers in this field. Another of his experimental associations has been with the principle of "generative music" which is essentially the use of a system to "generate" music. The system can be a wide range of things, from rolling dice, through to using patterns found in nature. However these days the generation is performed using a computer programme to create the music by setting up patterns and rules, and ntroducing variation and random factors to the performance. He has been associated with the software product "Koan" from SSEYO which allows composers to create generative music. As a composer, Eno has created a number of solo synthesiser and experimental albums, and has also frequently collaborated with other similar-minded artists. He coined (or perhaps borrowed) the term "ambient" to decribe his music and differentiate it from the many examples of canned music (or "musak") available at the time. This distinction was most important for his "Music for Airports" album for example. If you are a PC user you may well have come across one example of Eno's work because he also composed the start-up sound for Windows 95! His album "Music for Films" in 1976 consisted of a set of tracks for imaginary films. Then another association with film music is that Eno contributed a track called the "Prophecy Theme" to the film version of "Dune". (The "Prophecy Theme" is not the main theme but a dreamy track which plays a key part in the story.) Several of the themes from "Dune" have frequently appeared in albums of synthesiser music. His songs have also been used in various films such as "Castaway", "Cool World", "Se7en", "Trainspotting", "Traffic" and Moulin Rouge (in this case just fragments of the song "Heroes", which has appeared in numerous other films and television programmes). Continuing his associations with modern technology, Eno has been commissioned to compose a series of 20 Ring Tones for Nokia. Nokia and other mobile phone producers have been criticised in the past for producing annoying ring tones, and Eno's new ring tones are designed to attract the attention of the phone owner without annoying other people nearby. More recently, Eno seems to be finding a place as a score writer with a number of "shorts" to his name, and even some longer films such as "The Jacket" and most recently "The Lovely Bones" has gained a lot of press attention, though neither have received a soundtrack release. 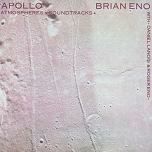 To celebrate the 40th Anniversary of the Apollo Moon Landings, Brian Eno reworked his album "Apollo: Atmospheres and Soundtracks" from 1983 which was inspired by the Apollo 11 mission. The resulting work was given two 2 live performances at the Science Museum in London in July 2009.